Understanding the amazing motherboard form factors. There is no doubt that you have heard about motherboards a million times, but does it really bother you to know how it works in conjunction with the other elements of a computer? Well, you are supposed to know a few things about your computer even if you are not looking forward to becoming an IT expert. For example, you should know a few things about your computer's form factors and how they affect its usability. 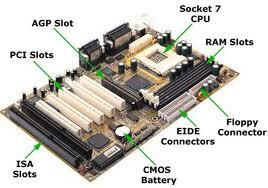 To begin with, motherboard diagramform factors are the greatest determinants of its size and shape. They also dictate the types of power supplies and cases that the motherboards will support. It is also up to the motherboard diagram form factors to determine where the mounting holes would be placed on a motherboard. Generally, the form factors determine the physical layout of the board. These form factors of motherboard become extremely essential when you are building your own PC system. They help you a lot in deciding what installations you need to purchase and where you will place them for better functionality. There are several types of motherboard diagram form factors although they evolve in a rather slow process. ATX is one of the common form factors that can be found in the computer market today. It superseded the original PC standard back in the year 1995 and since then, it has continued to dictate the formation of most PCs in the market. The latest version of this form factor was introduced in 2007. However, there has been other from factors that also make a significant contribution in defining how PCs should be build. There are several differences between the different motherboard diagram form factors that mostly depend on the target market. The major apparent differences between most of them include designs, sizes and other typical features. Also, since most of the modern computers have almost similar requirements, these motherboard diagram form factors vary with supersets and subsets of the computers.